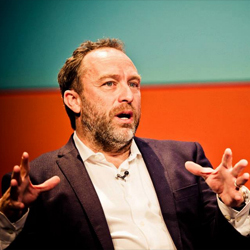 At the recent Accelerate 2013 ‘Festival for High Growth Businesses’, Jimmy Wales (Founder of Wikipedia and Chair of the Wikipedia Foundation) gave a fantastic talk about his successes and failures as an entrepreneur. He started off by saying “The title of my talk should really be ‘Failure, Jimmy Wales is good at it’ insisting that we all need to be more comfortable with the idea of failure if we are to ultimately succeed. 1. Apparently Jimmy ‘Jimbo’ Wales used to be an options and stock trader in Chicago which meant he did have some seed money to invest into his first idea, an online food ordering business in 1996. It failed. 2. His next idea was a search engine using pay per click advertising (sound familiar?) and a unique way for users to earn credits by sending traffic through it. It failed. (Chinese spammers took over the site in 3 months). 3. His third idea was a site called ‘Newpedia’ – an online encyclopaedia which used experts to write content for it. He spent $250,000 on the first of 12 articles. It failed. 4. However, this planted the seed of his next idea – a free encyclopaedia which was open to anyone to access and edit, featuring zero advertising. It succeeded…massively! Today, Wikipedia is the no. 5 website in world and 500 million people use it every month! It’s also still run as a non-profit organisation with the grand aim of giving free information to everyone in the world. 5. Riding high on his success at Wikipedia, Jimmy introduced Wiki Search – a new search engine tool which allowed people to edit and move search results and was widely hailed in the media as ‘Google’s worst nightmare’. However, it bombed and had to be shut down in the economic downturn. 6. Not to be deterred, his latest idea is Wikia – a service which aims to empower people to build the ‘library’ that sits behind Wikipedia. It already has 95 million monthly visitors and is in the Top 30 websites in the world. Success! So, despite having massive success over the years, Jimmy has also had plenty of failure too but it hasn’t stopped him from trying new things. The sign of a true entrepreneur it seems is the ability to keep trying and persevering even when the chips are down. Following his talk, Jimmy took part in an onstage, sit down interview with conference organiser Michael Harman (Seven Hills) to delve a little deeper into his life. Jimmy said that a common criticism aimed at Wikipedia is that it’s not as accurate as traditional encyclopedias but when people do serious academic research to compare it comes out very well. “The old encylopedias were never that good anyway and quickly out of date” he added. When asked what he was like as a teenager, he said he was a member of the school computer club in 1981. Since then, all those people have gone on to high level jobs in IT/Internet. The secret he thinks was early exposure and easy access to the latest technology! I think it’s arguable whether Wikia is a “Success!” If the company is so successful (after 10 years), why does it still need to go raise venture capital to fund international expansion efforts? Also, why did Jimmy Wales owe Wikia’s CEO a personal loan of $30,000?